Music in Cincinnati Boreyko, Schmid Illumine CSO's "Russian Hallows' Eve"
Boreyko, Schmid Illumine CSO's "Russian Hallows' Eve"
The Cincinnati Symphony Orchestra got the jump on Halloween with “A Russian Hallows' Eve” Thursday night at Music Hall. There was the obligatory “Night on Bald Mountain” by Mussorgsky (about a witches sabbath), the Violin Concerto No. 1 in D Major by Prokofiev, and rising from its resting place in the CSO repertoire after nearly 70 years, the Suite No. 3 in G Major by Tchaikovsky. 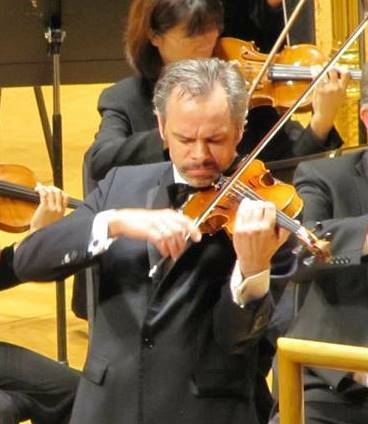 Soloist in the Prokofiev was violinist Benjamin Schmid in a brilliant CSO debut. On the podium was Russian guest conductor Andrey Boreyko is his first visit to the orchestra since his CSO debut in October, 2006. One hopes that Boreyko -- currently music director of the Orchestre National de Belgique and the Naples Philharmonic in Florida -- will be kept on the CSO guest list, for the performance was notable throughout for its textural fidelity and attention to color. Rarely has every detail of Mussorgsky’s tone poem emerged so clearly. Notable for their fine solo work were associate principal clarinetist Benjamin Freimuth and newly appointed associate principal flutist Henrik Heide. Austrian-born Schmid captured all aspects of Prokofiev’s Concerto, from its lyrical beauty to its daunting virtuosity. His impossibly soft opening statement set the stage for the variety of expression and panoply of effects heard in the work. The first movement (Andantino) evolved from a wonderfully bumptious ride to an ethereal conclusion, with muted violin cascading gently against woodwinds and harp. Schmid’s command continued into the Scherzo second movement, marked Vivacissimo and for a reason, with blistering scales, left-hand pizzicato, rapid down and up-bow strokes and playing in the violin’s topmost register. It was a gymnastic feat of the first order. Schmid produced a deliciously sweet, pellucid tone in the finale (Moderato) and, matched in kind by Boreyko and the CSO, built it to a majestic climax. The conclusion was extremely moving, as Schmid moved again into the stratosphere, where he executed precise, rapid trills. Tchaikovsky’s four orchestral suites gave the composer a break from composing symphonies, he said. The Suite No. 3 (last performed by the CSO in 1946) is an attractive and challenging work. Boreyko gave it the leadership it needed to make the fullest impact, and each of the four movements had its own distinctive character. The sunny, opening Elegy was marked by a beautiful sheen in the strings. The Melancholic Waltz, very serious by contrast, highlighted the violas and the English horn, played with distinction by Christopher Philpotts. The frisky Scherzo had the CSO players chasing one another to an abrupt, fortissimo conclusion. Longer than the rest of the Suite combined, the final Theme and Variations featured (very) rapid passage work in the strings, a bustling fugato, a soulful variation for English horn (compliments, again, to Philpotts) and a song-like variation and cadenza for solo violin, performed with spirit and polish by acting associate concertmaster Kathryn Woolley. The variations movement concludes with a majestic polonaise, announced by a brass fanfare. Boreyko built this to exultant heights, eliciting an enthusiastic ovation from the crowd. After taking his well-deserved bows, he shook hands with all of the CSO musicians within reach. Before the concert, CSO board president James E. Schwab announced a major new gift to the orchestra's endowment fund by Rosemary and Mark Schlachter.